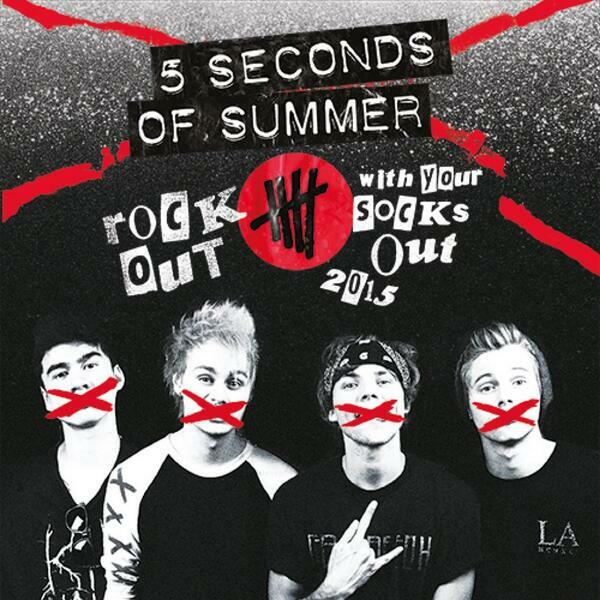 5 Seconds Of Summer – ‘Rock Out With Your Socks Out 2015 Tour’ Dates Revealed! After completing a small number of shows in both the UK and Europe, Australian band 5 Seconds of Summer have FINALLY announced a full-length arena tour! Luke, Calum, Michael and Ashton have confirmed the details of their first ever headline arena tour, which covers both places and we CAN’T wait to hear some of the tracks from their debut album LIVE! ‘Rock Out With Your Socks Out 2015’ will see the chart-topping foursome perform a number of live shows across the UK and Europe in May and June 2015, including a show at the NIA here in Birmingham on June 5th! 1/6 – Glasgow, UK//The SSE Hydro. 2/6 – Newcastle, UK//Metro Radio Arena. 3/6 – Leeds, UK//First Direct Arena. 5/6 – Birmingham, UK//The NIA. 7/6 – Cardiff, UK//Motorpoint Arena. 9/6 – Manchester, UK//Phones 4U Arena. 12/6 – London, UK//The SSE Arena Wembley. 13/6 – London, UK//The SSE Arena Wembley. Tickets will be available at 10:00am on Friday July 11th! American pop beaut Ariana Grande has teamed up with the gorgeous Iggy Azalea on her newest and brilliant track ‘Problem’, which features a further collaboration with Big Sean. Ariana Grande, 21 released the 90s influenced pop track with an urban twist on June 29th here within the UK and is already racing through the charts! Problem is to feature on Grande’s upcoming Sophomore studio album ‘My Everything’, which if the current success of the single is anything to go by, it will be racing up the charts very quickly after its release. Ariana Grande is an incredible, rising young talent with a large number of amazing tracks within her arsenal! And we personally can’t wait to see what she comes up with next!